Animation is a unique form of cartoon art, to the extent that it's so capable of expressing realistic forms of human emotion. There’s a huge difference between Popeye for example and the Princess Mononoke. 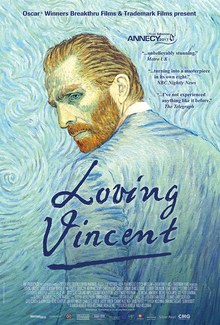 The enormous range of animation is illustrated in Dorota Kobiela and Hugh Welchman’s Loving Vincent, a gargantuan project which employed 115 artists to create the 65,000 paintings of which the animation is comprised. The fact that the animations themselves are faithful to the art of their subject, only increases their resonance. There's an almost nuclear effect to the shimmering images which are detonated by Van Gogh’s signature brush strokes. The movie, of course, needed a plot, and the central story which takes place a year after the painter’s death, deals in an almost forensic manner with the question of his suicide and whether he was suffering from what today might be termed bi- polar disorder in which a precipitous mood shift brought about tragic results or whether he was in fact “soul murdered,” by the jealous Dr. Gachet, who was also the model for one of van Gogh’s most famous and highly valued paintings. What's peculiar and enchanting is to stare into animated faces of the cast of characters in looking for clues, though the story for all its twists, turns out to be a fairly open and shut case, at least in the filmmakers’ formulation of events.